As I noted in an earlier post on my book shopping spoils, last weekend I found myself in Minnesota. I guess that makes it sound like it was an accident or a surprise when it was neither. As I do with most travel, I knew months in advance that I was going. I haven’t been back for about five years or so and thought I would take advantage of the holiday weekend and the fact that John had a work trip that encroached on the weekend. 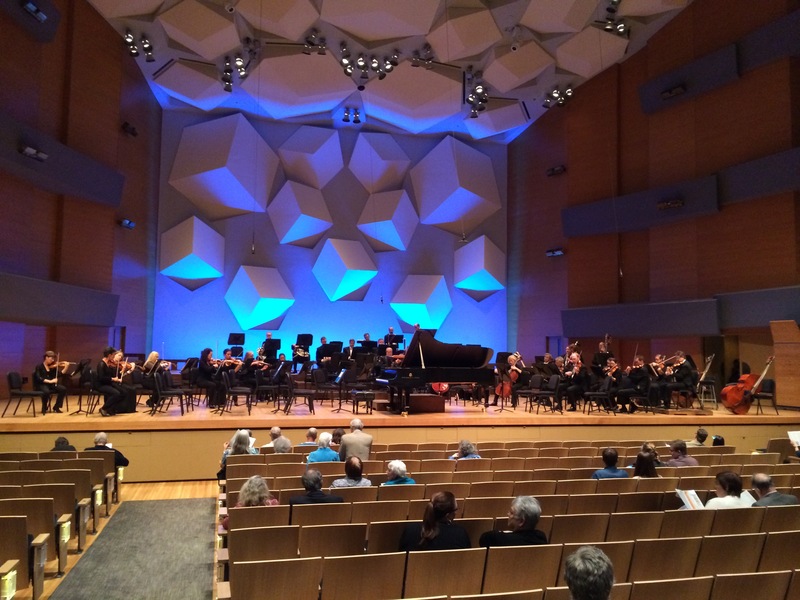 One of the first things I did once I decided to go was to see what the Minnesota Orchestra and the St. Paul Chamber Orchestra were up to that weekend. Thankfully both of them had programs I was interested in hearing and thankfully both of them were playing both Friday and Saturday nights so I wouldn’t have to choose between the two. For as long as I lived in the Twin Cities and for as often as I went to orchestra concerts there, I can probably count on my hands the number of times I have heard the SPCO play in person. It’s nothing against them, they are a phenomenally good orchestra, but I tend to prefer the repertoire of a much larger, symphony orchestra. For me a lot of chamber music is background music. Beautiful and eminently worthy, but harder for me to sit through in a concert setting. But sandwiched in between a Bach violin concerto (No. 1) and Schubert’s fifth symphony was one of my favorite pieces of music of all time. Arnold Schoenberg’s Verklärte Nacht (Transfigured Night). A lovely piece of music for strings based on a the poem by Richard Dehmel and written before Schoenberg moved on to his atonal phase. I’ve only ever heard the piece in concert once before. In 1994 at the Kennedy Center performed by the Orpheus Chamber Orchestra. Orpheus is a great band, so it had to have been a good performance, but the experience didn’t really leave an impression on me. After my experience in St. Paul last week, I think I know why. 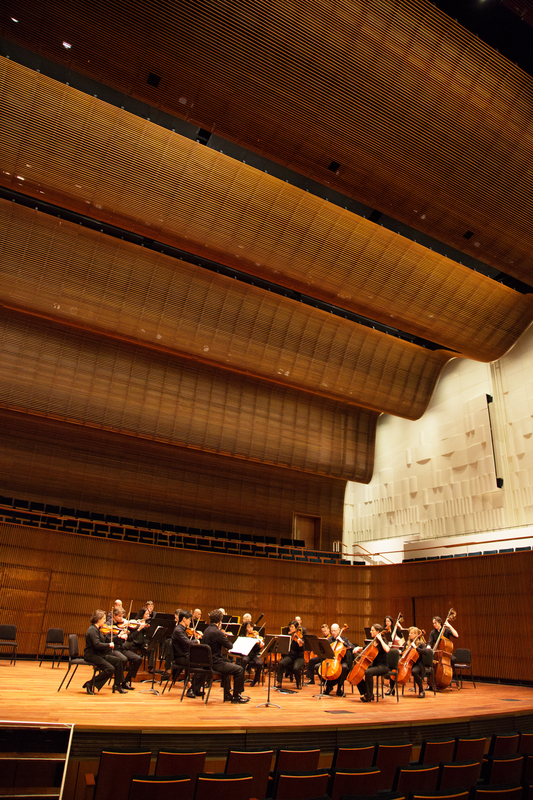 The SPCO plays at a variety of smaller venues around the Twin Cities; churches, temples, and until now mainly at the Ordway Music Center–a largish venue that is also the home of the Minnesota Opera. Much to my surprise, something that had completely gone under my radar, is the fact that the Ordway recently completed construction of a purpose-built concert hall especially for the SPCO. The new venue has about 1,100 seats and was designed to compliment the SPCO which numbers about 30 musicians depending on the piece of music. To be able to hear such a fine chamber orchestra play in such intimate setting with wonderful acoustics was truly a transcendent experience. Schoenberg’s Transfigured Night was shimmeringly beautiful. I’ve listened to it hundreds of times, but watching the musicians make the sound at such close range really heightened my awareness of what was going on the piece. More than once I felt like I was in Europe, the experience seemed too special to be happening domestically. There aren’t many professional chamber orchestras in the world, with the SPCO being the only one in the U.S., and to have such a perfect venue on top of it…it all just seemed too good to be true. Could this really be normal? Especially with the equally fine Minnesota Orchestra performing about 10 miles away on the other side of the Mississippi? The whole evening put me in such a good mood and had me plotting future trips to Minnesota just to hear the SPCO. Sounds crazy but I once went to Cleveland on spring break (and two more times since then) just to hear the Cleveland Orchestra. About a year ago things seemed doooooomed for the Minnesota Orchestra. The venerable group had never sounded better and its reputation and recordings were lauded around the world, but a labor dispute had the orchestra silent for over a year. Reading the stories in the New York Times as all this was going on was crushing for this hometown fan. But that was then. 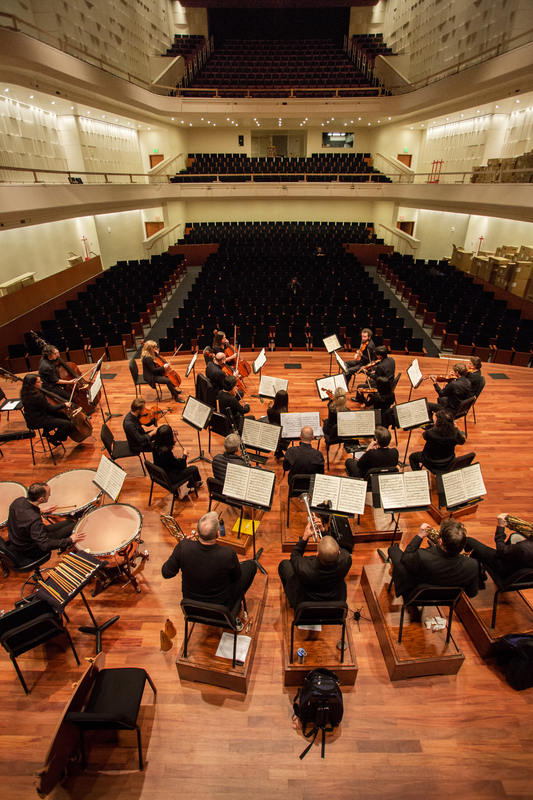 Now the Times is writing about the orchestra’s historic concerts in Cuba and the orchestra and conductor have contracts going to 2020 and 2019 respectively. A perfect time for me to hear them again. 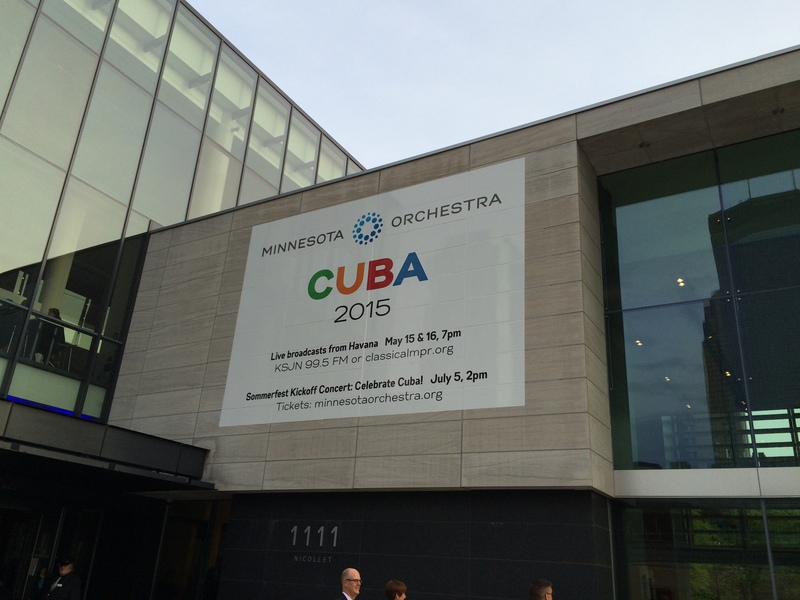 If you want to see pictures and hear the concerts in Cuba, you can go to Minnesota Public Radio’s website and check it out. The concert didn’t disappoint. 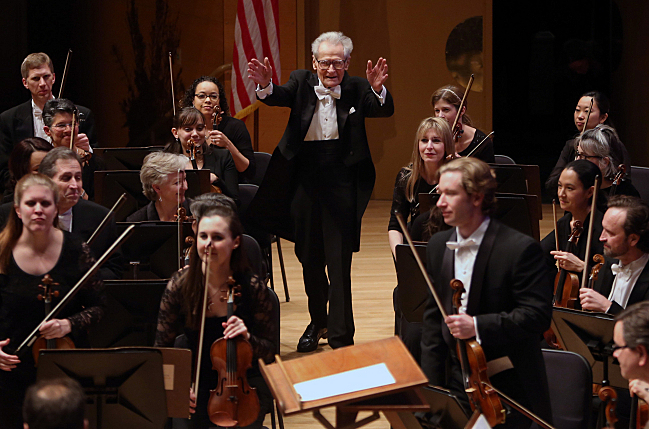 It was especially heartwarming to see the orchestra’s Conductor Laureate, Stanislaw Skrowaczewski conducting. The man is 91 years old and can still wave his arm for two hours. And he still travels around the world to do it. The thing that struck me most about the evening was how lively the crowd seemed. 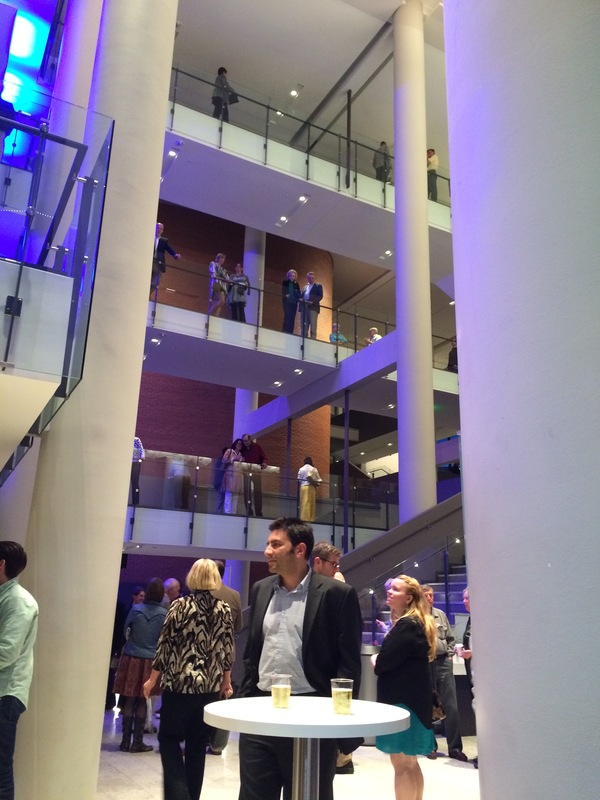 Young students, in the recently expanded lobby, horsing around on a baby grand during intermission added a rather fun twist to the normal milling around with a drink in a plastic cup. No doubt the orchestra and the SPCO the night before are trying to entice/retain audiences by letting people bring in beverages into the hall. Part of me thinks this is a stupid idea, but part of me kind of likes how it seems to be loosening the whole thing up a bit. I used to be the cranky old man who was ready to cut someone dead with the stink eye if they so much as breathed the wrong way during a concert. I am rather still prone to be that old curmudgeon, but it was kind of nice to just think, what the heck, and sit back and enjoy the show. The refurbished Orchestra Hall sounds as good as ever. Are they cubes thrown into a wall or some other kid of shape. A conundrum since I first sat in the hall as a 10-year old for a Canadian Brass concert. 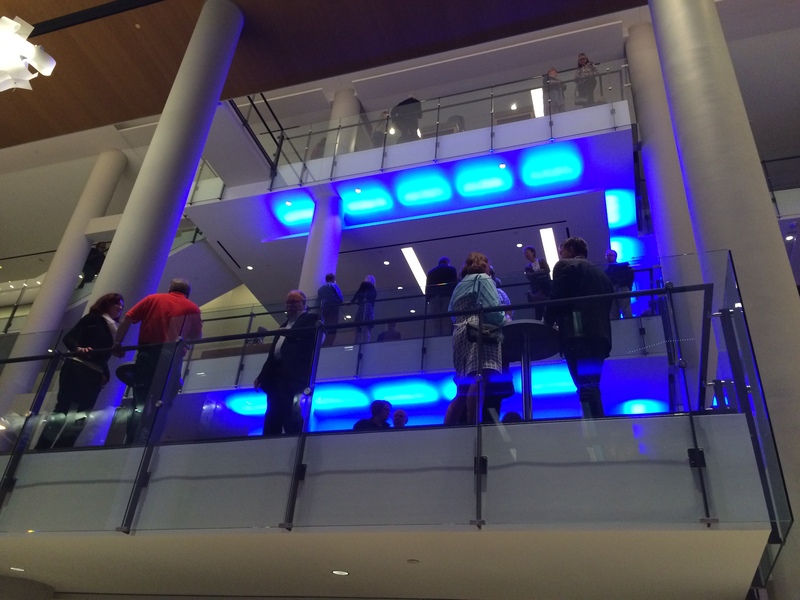 The new lobby is much less staid and roomier than the old one. Next Article Why didn’t Eric inspire me sooner?